Symbol of the capital par excellence and architectural masterpiece of ancient Rome, the Colosseum, with nearly five million visitors a year, is the most visited attraction in Rome. Whether you’re visiting the capital for a couple of days or planning to stay longer, don’t forget to add this attraction to your itinerary for visiting Rome. 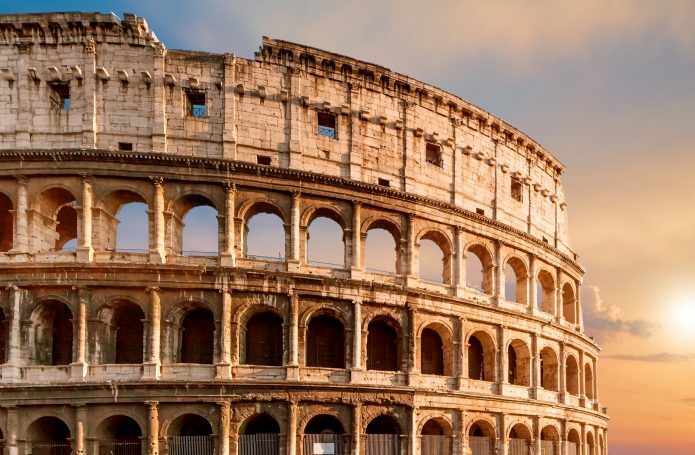 The Colosseum will surely leave you breathless, thanks to its spectacular dimensions (it’s the largest Roman amphitheatre in the world) and the emotional impact it will have on you (the evidence of so much cruelty and ferocity is something that cannot be ignored). Long waits for entering this attraction are the norm. We recommend buying an online ticket that lets you skip the queue, saving time for visiting the other wonders of the capital. But what did the Colosseum look like? Below we offer some details about the structure of what became the model for all future sport stadiums. Once entirely covered with travertine, the exterior is divided into three levels of arches, framed by pilasters (rectangular columns embedded into the wall). The intermediate and higher level arches were sculpted with statues, while the highest part, with its Corinthian windows and pilasters, is characterized by supports for the 240 masts that once sustained the velarium, a huge fabric awning that covered the arena. On the ground floor there are 80 arched entrances (vomitoria), which allowed spectators to enter and take seats in a few minutes. The ground had a wooden floor covered in sand to prevent the gladiators from slipping and to soak up the blood. The arena could be flooded during re-enactment of sea battles (Naumachie). The underground complex of corridors that constituted the hypogeum could be accessed through trapdoors. The Cavea, for spectator seating, was divided into three parts: the lower rows were dedicated to the Senators, the middle rows for wealthy citizens, and the upper rows for lower-class plebeians. All women—excluding the vestal virgins—were placed at the very top. Much as they are today, entrance tickets were marked with the seat number of a specific sector. The podium, a broad terrace in front of the seating rows, was reserved for the Emperor, Senators, and other elite Romans. The underground complex system stretching under the entire structure was used as a backstage. Here props and set pieces for naval battles were built and then lifted with a complex system of ropes and pulleys. Gladiators would reach the Hypogeum directly from the nearby gladiator school, and wild animals were transported to the Colosseum from a “zoo” on Monte Celio, where they were kept in cages built directly into the wall.